How Can You Get Your Smile Back? A damaged smile can damage your confidence and your chances for success. Learn how you can smile with confidence again with our restorative dentistry solutions. If you don’t like flashing metal every time you smile or if your tooth requires cavity treatment, white fillings can give your tooth its strength and natural appearance back. White fillings, also known as composite fillings or mercury-free fillings, are porcelain or resin-composite dental materials that are tooth-coloured, natural looking and designed to blend perfectly with the existing structure of your tooth. If your tooth requires additional reinforcement after cavity treatment or root canal therapy, a crown or a cap is placed on top of your tooth to protect it from future infection and your bite pressure. A bridge is a missing tooth replacement that is attached to adjacent teeth to prevent your gums from receding and your teeth from shifting out of position. 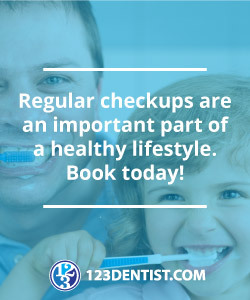 Missing teeth can ruin more than your smile – missing teeth can cause your gums to recede and your remaining teeth to shift out of position, ruining your bite and exposing you to potential oral and overall health problems. Dentures are a removable set of false teeth that can be either partial or complete. Current dental technology has made dentures the most comfortable and natural-looking possible. Inlays/onlays are one alternative to fillings and crowns for the strength and look of your smile. Inlays/onlays require just two appointments at our Burnaby dental clinic and are virtually indistinguishable from your natural teeth. Inlays restore the inside of your tooth and onlays restore the crown of your tooth. Contact us today to see how your smile can regain its beauty and functionality.